Marcus Waring and Ryan Bougie convened in Whistler Village at 8:30A.M., after stumbling out of our respective residences on the morning of Dec 1, 2007. Our plan was to ski Mt. Sproatt, a sub alpine peak that dominates the whistler skyline. Using The Valley Trail system and a little bit of Alta Lake Rd. we reached the trailhead around 10:00 A.M. We encountered another group of winter, outdoor enthusiasts at the turnoff leading to Mt. Sproatt (~1300m). Early season snow coverage provided us with less than ideal conditions and, as a result, boot packing was in order through a brief 50m section. We summitted with good views of Rainbow Mountain. We proceeded further across the broad summit plateau to gain views of the famous radio tower and Whistler Village itself. At that point, we de-skinned and began our descent of the mountain on skis. Fantastic powder snow was to be had upon reaching the shelter of the trees. We snagged another lap before making our full descent. The descent through the lower trees can be rated as “a technical-bush-ski with many mandatory bush-belay/mini-airs to negotiate cliff bands” we had chosen to ski. 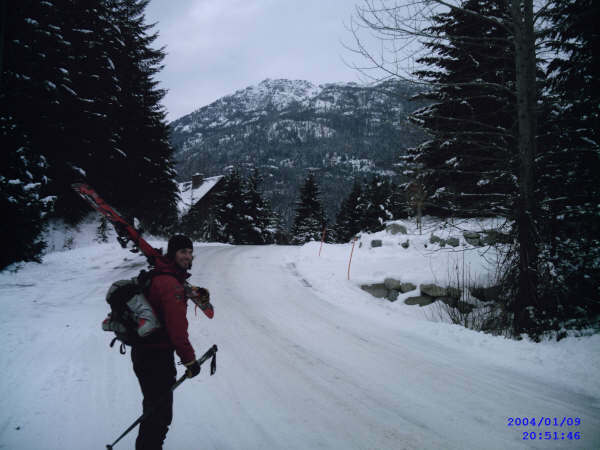 We continued on skis to the Whistler Cemetery where we once again saw the other group of skiers and “slowshoers”. Their summit bid was to be unsuccessful this day. We shouldered our skis for the 1-hour walk back to the whistler trailer park we call home sweet home. A crucial planning error was incurred at this stage of the trip, as we had forgotten to stock up on beer to nourish us with valuable and depleted energy reserves; learned us real good. Good times had by all.